In light of the recent violence in Turkey, particularly the Turkish state’s assault on the mostly Kurdish cities and towns in the southeast, the Armenian Weekly spoke with Abdullah Demirbaş, the former mayor of Diyarbakir’s Sur municipality. Demirbaş was imprisoned by the authorities from August to October 2015; he was released from prison due to health concerns, as he suffers from deep vein thrombosis, a serious condition where blood clots form in a vein deep inside the body. Demirbaş has been continually targeted by the ruling authorities. His latest arrest was part of a larger wave of charges filed against a number of Kurdish politicians following the June 2015 general elections in Turkey, when the ruling Justice and Democracy Party (AKP) won a majority in parliament, but failed to secure a supermajority. Those elections brought the pro-Kurdish Peoples’ Democratic Party (HDP) into parliament, with 13 percent of the vote. Failing to form a government following the June elections, the government scheduled a snap election on Nov. 1, 2015; the months leading up to the elections saw a number of terror attacks (such as in Suruc and Ankara), a renewed war against the Kurdish Workers’ Party (PKK), and the targeting of Kurdish-dominated areas in the southeast of the country, where the HDP had fared especially well during the elections. Diyarbakir’s Sur district has suffered tremendously during this campaign of violence, which has transformed the streets into a war zone. Armenian Weekly Editor Nanore Barsoumian and contributor Tsoler Aghjian teamed up to conduct the following interview with Demirbaş. The embattled politician spoke about the current oppressive atmosphere in the country; the situation in Turkey’s southeast; Turkey’s foreign policy, particularly in relation to Syria; the challenges facing peace and democracy activists in the country; and his own imprisonment. Demirbaş criticized Turkey’s foreign policy—including the support extended to ISIS—which has been gradually isolating the country. “The developments on the international level and the assistance that Turkey provides to ISIS and al-Nusra have isolated Turkey away from the international powers. Turkey should stop giving such aid and should get rid of these fundamentalist approaches as soon as possible. … Otherwise, the war in Turkey could lead to a world war, and this is very serious,” he said. Armenian Weekly—Mr. 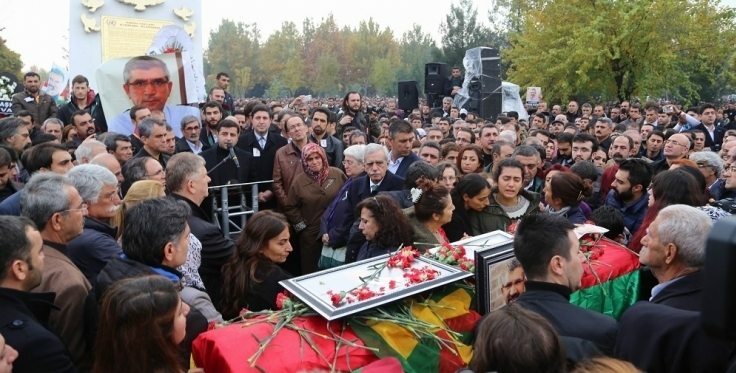 Demirbaş, what are your thoughts on the political atmosphere in Turkey, taking into account the violence that has ensued—in particular the murder of Tahir Elci [a prominent human rights lawyer who was killed in Diyarbakir], and the arrests and imprisonments of politicians and journalists critical of the policies of this government? Abdullah Demirbaş—First of all, I would like to say that right now the dominating atmosphere in Turkey is that of a war, and unfortunately the current government has announced a war against all those who think in a way different from its own beliefs—those who have opposing thoughts, those who support the idea of democratic peace. Those who express such thoughts are being either arrested or killed, which is creating an awful atmosphere in Turkey. However, if Turkey had allowed the development of the democratic process and that of the peace process, we would have a completely different atmosphere today. Nowadays, in the middle of this chaotic war, speaking about peace is leading the peace advocators to death or to very serious and dangerous situations…and this was proven by Tahir Elci’s murder, the arrests of the intellectuals, the journalists, and the writers who criticized this crime, as well as by the jailing of the mayors, deposing them from their seat or hindering the fulfillment of their duties. In August, I was arrested and now it is forbidden for me to teach anymore. We also faced other types of oppression, simply because we defended the democratic politics and because we believed in peaceful resolutions—and we will keep on defending them. Tahir Elci was one of those people who expressed their thoughts very clearly: He was the president of a bureau that focused on peaceful ways and methods for solving conflicts…and because he thought in this way, he was killed by the dark powers. This is why we cannot say that the political atmosphere is fine, since there are some discouraging developments. But I haven’t lost my hope yet for the coming future. A.W.—Many Kurdish areas in southeastern Turkey—from Cizre to Sur—have been devastated by military operations. Many residents have fled the area. Could you discuss the current situation in your region and the challenges ahead? A.D.—The latest conflicts are beyond the situation that was once seen during the 1980’s; this time we are witnessing the destruction of historical places, particularly Cizre and Sur, which are important historical regions for all of human history. On one hand, we can see the depopulating efforts being carried out in these regions, by killing people there, and on the other we can notice that people’s historical heritages are also being exterminated. So, along with the loss in the population numbers, there are efforts to erase certain regions from the historical maps and also to erase the collective memory of the population. We can compare the current situation to what happened in 1915, when the bond between humans and places was broken, the historical memory was erased, and the people and the cities were destined to be rootless… This is why in such conditions we are facing developments that are grieving us—like the killings, the persistent conflicts that are far worse than those that occurred in the 1980’s, as well as the policies that encourage people’s migration and extermination. For these reasons, in order to stop the killings and the conflicts and in order to lift the curfews, we are urging both the government and the PKK to return to the Solution Process [the Kurdish-Turkish peace process]. The higher the number of casualties, the harder it will be to compensate the losses. There is also something even worse: An emotional detachment is swelling between the east and the west of the country; the gap is increasing and we are all collapsing. This means that the opportunity for Turkey’s different peoples and religions to live together in the same place is being devastated, and this is very worrisome. When one side of Turkey is in war while the other side is senseless about it and is even glad that such killings are happening, this makes us feel awful about what’s happening around us. When the pain is not being shared, then this pain will increase with time. Therefore, we want for this pain to be shared in order to cultivate the common desire to live together in the same country. A.W.—How do you assess Turkey’s policy regarding Syria, in general, and the Kurds in the area, in particular? How has that affected domestic policies? A.D.—It’s not just Turkey’s policy concerning Syria, but Turkey’s foreign policy in general that is failing. [Turkish Prime Minister Ahmet] Davutoglu once said that there will be zero problems with Turkey’s neighboring countries; actually there isn’t any neighboring country left with which Turkey has no problem at all. Turkey, with its strategies and its authoritarian and absolute totalitarian approach, has lost a number of its friends both on the local and the international levels. Due to its policies regarding Egypt, Libya, Iraq, Syria, and Cyprus, Turkey is getting lonelier in the international arena with each passing day. We can say that this loneliness is due to the fact that Turkey failed to maintain its democratization and also failed to face the mistakes of the past, by not envisioning a better future for society and by not providing an appropriate apology. Of course, Turkey’s policy regarding Syria is further evidence of its loneliness. Turkey is living in such paradoxical situations, where it has become enemies with its once closest brothers. The developments on the international level and the assistance that Turkey provides to ISIS and al-Nusra have isolated Turkey from the international powers. Turkey should stop giving such aid and should get rid of these fundamentalist approaches as soon as possible. It must maintain peace among the different ethnic and religious groups, and build its relationship with neighboring countries on the right foundations. Otherwise, the war in Turkey would lead to a world war, and this is very serious. On the one hand, in Turkey, the war against the Alevis, Armenians, and Assyrians has restarted, while on the other, the conflicts between Syria, Iraq, Iran, Russia, Greece, the United States, the United Kingdom, and Israel are expanding. A.W.—The HDP has continued to use a language of peace and brotherhood. What are the challenges facing proponents of peace in Turkey today? A.D.—In Turkey, advocating for peace; defending democracy, freedoms, and the right for different peoples to live together; and securing peoples’ rights by amending the constitution, are all considered acts of opposition towards the official ideology—they are all considered acts of terrorism. Despite this, we, the HDP, have taken the side of peace, democracy, and freedom. The HDP is actually the peoples’ garden in Turkey. Despite all these obstacles, the arrests, the killings, and despite this parliament which doesn’t allow the practice of politics, the HDP is still insistently and stubbornly carrying on. The parliamentary immunity of our MPs is being removed, our municipal mayors are being deposed from their seats, and despite the different types of administrative and political oppression, our party is still stubbornly defending peace and democracy, and will continue to do so. Politicians like us are being handed 100-year sentences by the courts. For example, there are dozens of cases that are being carried out against me, and despite the fact that I was elected mayor by receiving 66 percent of the votes, I was convicted [and received a sentence of] almost 280 years of imprisonment. I have never been part of an armed action—we only wanted for democracy and peace to find their way and for the different peoples to live together peacefully, whether they are Armenians, Assyrians, Kurds, Arabs, or Lazes. We wanted them all to live together in Turkey. We wanted their rights to be secured by the constitution. We wanted to ensure that all the languages are used and are accepted by all. We wanted a country for the different religions: Christianity, Alevism, Yezidism, Islam, Judaism, and even for those who do not have a religion. What did we get in return? A punishment that is meant to last for hundreds of years. I was put in jail twice, I was released three months ago. We will keep on moving forward because we still believe that Turkey is the garden of all peoples and our duty is to protect this garden. If we annihilate others, we cannot exist and we will not exist. A.W.—In a New York Times op-ed, you said that your generation might be the last to be able to reach a peaceful settlement through dialogue, and that possibility, as well as hope, are under assault. Do you see a path forward? A.D.—By saying that my generation is the last to reach the Solution Process, I meant that as long as Turkey continues to constrict democratic politics and tries to remove it from the system, the coming generations will lose faith in [being able to use] democratic practices and methods in resolving their problems. The diminishment of democracy is withering peoples’ faith in conflict resolution, dialogue, and mutual efforts to decrease the opposition of both sides. The message that the current generation is receiving is: “Politics is no longer a solution; choose violence and conflict instead.” This is why the new generation is like a hurricane that cannot approach resolution and reconciliation. One of them is my son. Seven years ago, when he was a 16-year-old boy, due to the lack of the democratic passion in him, he chose to search for the solution through violence and weapons and he went to the mountains. Today—especially after seeing the state’s approach towards the people in Cizre and Sur—thousands of youth are joining [Kurdish] armed forces. Despite all these facts, I still haven’t lost faith in the future: I still believe that democratic politics will win in Turkey and that the “die and kill” logic will be replaced with a “live and guard lives” logic. It has been 100 years since there was an attempt to annihilate peoples in Turkey, and there still is no suitable solution to these attempts that have targeted the Armenians, Assyrians, Chaldeans, Alevis, Yezidis, and Kurds. These kinds of approaches are repelling people away from the state; they are cherishing violence instead, and thereby such approaches must be replaced with a democratic system. We believe that it will be replaced soon since people are waking up. For this state to have a powerful position in the Middle East, we have to sit down with this generation and try to find a solution as soon as possible. A.W.—How have the efforts that you made to revive Armenian and other heritages in Diyarbakir been affected by the current situation? A.D.—In Diyarbakir and in our region, in general, we accept the heritage of different peoples and religions as our commonly shared heritage. Every city has its own identity; every city has its roots. By depriving cities and peoples from their roots, we actually destroy humanity. This is why it is our duty to protect different heritages, whether Armenian or others. This is our duty first as mayors or city governors, and, second, because historically we have an apology to pay to these peoples. Therefore, whatever efforts we made in Diyarbakir were based on this idea. They were an expression of an apology on the one hand, while on the other hand, we believed that the common heritage of the city must be protected. For this purpose we made “the street of cultures” project: the restoration of a mosque, a Chaldean Catholic church, an Armenian Apostolic church, an Alevi house, a Yezidi house, and a synagogue. At the same time, we revealed this cultural wealth of the city and we wanted to create a peace model in the Middle East in order to show that people from different ethnicities are able to live together. In the Middle East, there are two important issues: first, the linguistic and/or ethnicity issue, and, second, the religion and faith issue. To solve the ethnic problems, we came up with the “Multilingual Project.” Again, based on these principles, we have built a genocide monument to be the first in Diyarbakir, and the first in Turkey, to pay our apology to Armenians, Assyrians, Chaldeans, Alevis, and Jews, for the genocide that was committed by the Muslims, and to promote the idea that different peoples are able to live together despite their differences. The state has created conflicts among its peoples in order to maintain its power. We, as peoples, have awakened: We are facing our past mistakes and apologizing for them. But also, our goal behind the establishment of this monument was for the dominating powers to pay their apology, for doing this to their peoples. Besides the genocide monument, we have constructed a “love” monument since we saw that through love we are able to face the past and build the future together. In Diyarbakir, in 2011, we formed a committee [Kirklar Committee/the Council of Forty] consisting of people from all different ethnic groups in order to preserve the justice in peoples’ representation. This way, we promoted the idea of building a future together…of course, after learning from our past mistakes. We have paid a heavy price for this; as you know, I was deposed from my seat as mayor in 2007, and I was arrested twice. But despite all this, we haven’t lost our belief in these principles and we will never give up on them. A.W.—You once said that you wish for the Armenians what you wish for the Kurds. What kind of a future do you envision for the Kurds in the region today? A.D.—To live democratically means that whatever you wish for yourself you also wish for all the people with whom you live. On this basis, the “Multilingual Project,” the “Street of Cultures Project,” the genocide monument, and the Kirklar Committee have been put into reality. Whatever my approach is towards my ethnicity, my region, and my culture, it will be the same towards those of the people with whom I am living. If I didn’t wish the same to all those peoples, then that would lead us to a situation that’s not so much different than what it is today. For the first time in Turkey, we published brochures in Kurdish, Armenian, and Turkish. We published books on fairytales. We officially took the decision to have a multilingual municipality. We also renovated the religious houses, churches, etc. You are only a democrat as long as you know well the peoples you live with. It is my duty as a human to wish for those with whom I live whatever I wish for myself, and it is worth doing so. This is why I am wishing freedom for the Kurds and I will also wish freedom for the Armenians, Assyrians, Chaldeans, Yezidis, and Alevis, no matter what I might face as a result. I know that even if I sleep in a jail cell for a thousand years, I will keep on believing that…so that we would all live as humans and our lives would be beautiful, because this is the right thing to do. It is hard, but it is beautiful. … We will keep on doing what is beautiful. I send my respects to all the oppressed people—whether they are Lazes, Kurds, Armenians, Yezidis, Persians, Chaldeans, Assyrians, Alevis… I would tell them that I am with them and that I want to live together with them. Maybe it’s hard, but living together is possible. They may separate peoples from one another, but we will not be a part of this game anymore. History taught us—we have faced our past and we will build our future on the right foundations. The future is to live together. Borders are meaningless. Freedom is what matters—we will walk the road to freedom. There is nothing more precious than freedom. A.W.—What can you tell us about your imprisonment? Why was it conducted at that particular period of unrest and violence in Eastern Turkey? And how is your health status nowadays? A.D.—As you know, I was first arrested in December 2009 and after seven months I was released due to health concerns. In August 2015, after participating in the Pan-Armenian Games and after meeting President Serge Sarkisian, I was arrested again when I returned to Turkey. After almost two and a half months of imprisonment, I was released as a result of a public campaign. This is why I am subjected to a control process—I have to submit my signature at least three times a week. I am also forbidden to leave the country, so I am currently following my treatments in Istanbul and other cities in Turkey. I really didn’t receive any treatment while I was in jail. I have [medical] reports [suggesting that] I receive treatment outside of Turkey, but I am not able to travel, so I am restricted to the available treatments here. I am continuing the struggle despite my poor health. I am determined to stay on my feet because I believe that my resolve will also help me fight against my disease. I would love to give my thanks and respects to all the Armenians, Chaldeans, Assyrians, Yezidis, and all the peoples of Turkey, as well as the Armenian, Assyrian, and Kurdish diasporas that supported the campaign that led to my release, and thereby [resumption of my] medical treatment. You have a wonderful personality with great ideas, God bless your family and your mission. It would be interesting to do DNA testing on Eastern Turkish Kurds to really see how much Armenian is in their blood. I bet quite a bit. Turkey is a vile predator genocide created stole from others state. Never believe and always deny that they are an “indispensable ally”. They certainly are not,. In fact they actually gained from these Genocide and our State Department knows this well and doesn’t want that to change that. Thats why the USA, Israel and Great Britain will never acknowledge the Genocide. They ‘gained from it in some way shape and form and acknowledgment means losing that gain..